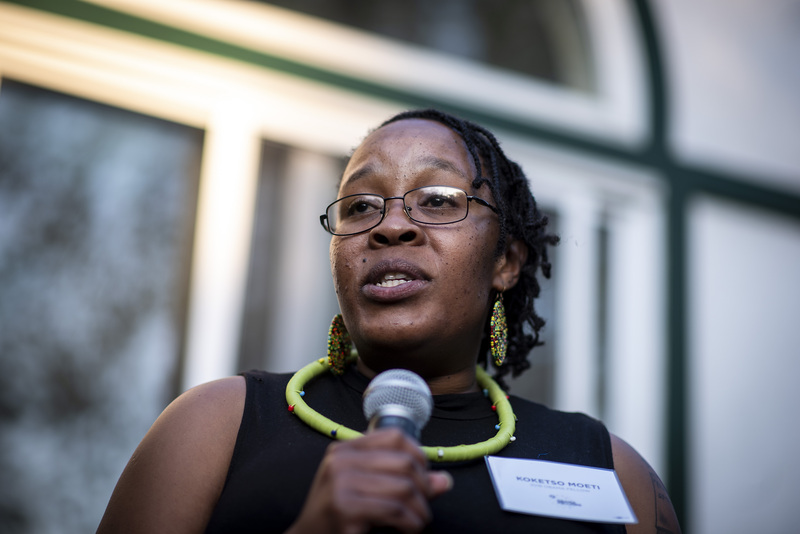 In her native South Africa, Koketso Moeti has seen the hardships people of color—especially low-income black women—experience as a result of decisions made well above them. And she’s lived through the ways those decisions can harm progress within a community. But with the power of technology, she knew there was a way to amplify voices to counter those who would try to quiet them. That’s why she founded amandla.mobi, a digital platform to fight the limits society has placed on the most vulnerable in her society, or Mzansi, and beyond.amandla.mobi has over 250,000 members, a majority of whom are women. The mobile and multilingual platform empowers members to enable collective action on issues, ranging from public safety, to education, to the cost of communication, to creating change from the palms of their hands. Q: Let’s start with where your journey began. What initially brought you to this work? A: It was really an accident of being born in a certain space in history. I come from a country of many divisions, many of which impacted my own life and the lives of those around me. So in many ways I didn’t choose to be in this space, I was agitated into it by the conditions around me. That’s part of South Africa’s history, and some of those divisions haven’t been removed, they’re actually replicating themselves and manifesting in new ways. I’ve always loved to read, and I’m fortunate to have come from a family that is deeply engaged in their community. One of the things I used to love most as a child was sitting on my mother’s lap and hearing her tell me stories about the black consciousness movement, the anti-apartheid movement, and fighting for a better future. As a result, I’m a believer in the possibilities and hope that are enabled by collective action. But it was really when my own community faced a forced government eviction that I found myself agitated into action. During the time, I got access to a cell phone and using it enabled the coordination of actions with so many others. A strong affirmation of the power that lies in collectives. Q: What was it like to grow up in this homeland model, especially during apartheid-era South Africa? And how did that lead you to your current work? A: My community was made up of mostly farm workers who were given a piece of land to live on, given the worries that white farmers would evict them after 1994. Eventually, the government received a lot of money to develop the area, which included providing housing and installing water taps, which never happened. At that point, the government wanted to forcibly evict us, and around that time, I had gotten a cell phone. I suddenly had more access to information about how to resist evictions, and started a blog where I would write about what was happening around me. Media began covering the issue, we were able to get legal assistance, and would send bulk SMS texts to neighboring communities any time we were organizing a protest so they could shut down their roads so the police couldn’t reach us. One cell phone allowed the coordination of mass action; we went from a community of 1,500 households to having people from every corner of the country fighting alongside us to keep us in our homes. Q: Wow. What happened next? What was the result of that collective action? A: The eviction was rescinded, an amazing success which led to organizing for the provision of services in the community. But at the same time, I watched myself being made a defacto power broker within my community. It was almost as if I had single-handedly done all this, when in fact, so many others contributed in a variety of ways. The only reason I was able to use the Internet the way I did was because unlike most of my peers, I went to school outside the community and became English-literate, which meant being afforded space to be heard in ways many others were denied. The question then became, “How can someone replicate this form of organizing, at scale, in ways that people can connect with each other, but without creating de facto power brokers?” After giving this a lot of thought, it became clear that the one thing that South Africans have in common across racial, class and gender divisions is a cell phone. That was key in starting amandla.mobi. Q: How do you think your experiences protesting and leading your community at a young age have influenced your work at amandla.mobi? A: If you look at South Africa’s history and the country today, we’re known as the protest capital of the world. People, especially low-income black women, have been at the forefront of leading resistance. No one was or is sitting around waiting for any organization, including amandla.mobi, to rescue them. We know that people—myself included—are taking action, so we really see our role as figuring out the best way to support, amplify, and connect the actions that people are already taking with others in a way that incentivizes accountability from government and corporates. I think we’re well aware that power in South Africa is distributed and exercised unequally, but no individual or organization is going to change the country, the continent, or the world alone. So for me, collective action is understanding how to build an ecosystem in which people are all working together and contributing what we can to build the world we want. Doing this means understanding that there’s no single way of contributing towards advancing a struggle, so no contribution should be undervalued and overlooked. For example, many people think that being in the frontline of a protest is the only way to show one’s commitment. But the reality is, I am only able to be there when someone else is watching my children or doing other things that enable me to be there. This is as valid a contribution as any other. Q: Can you help us understand the interface the platform uses? How exactly does the action translate into change? A: The core mission of amandla.mobi is bringing people together to take collective action on issues affecting the black majority of South Africa, particularly low-income women. To do this, we use a combination of mobile tools, like Whatsapp, text messaging, a mobi site, and unstructured supplementary service data to get people to join petition campaigns. Over and above the signature, we also enable people to climb up the ladder of engagement, whether it’s by making submissions, organizing events, or directly communicating to those in power. Another big part of what we do is trying to show just how connected seemingly different struggles are. By ensuring that members stay connected, we facilitate a journey where someone who joined an anti-racism campaign is exposed to gender-based violence campaigns, for example. It’s also about taking the energy of members beyond viral campaigns by linking them to the systemic issue, like the current issue of high costs for data being a form of economic justice. 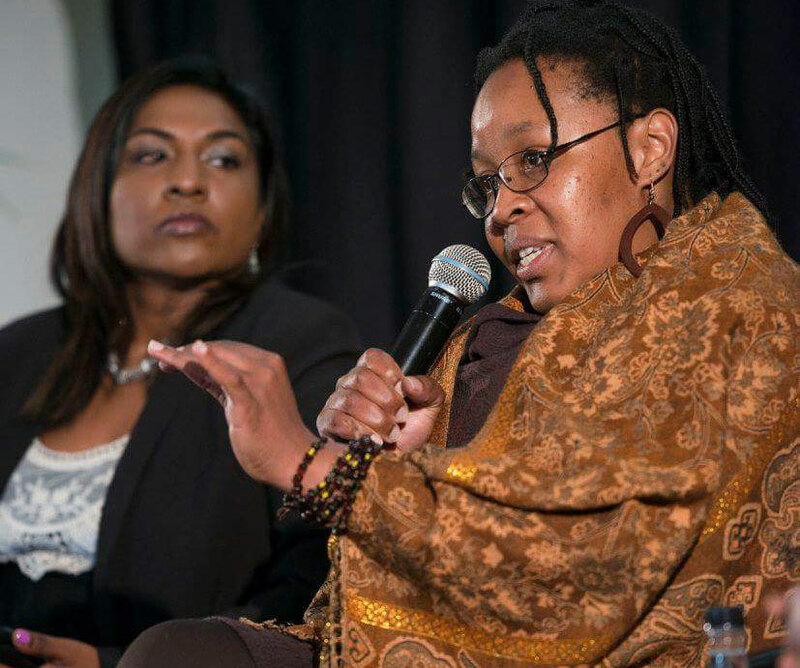 A more concrete example of our work in action was around the “pink tax” in South Africa. This was a petition campaign that sought to eliminate the tax placed on sanitary products, and it was successful. Those who joined the campaign took other actions like coming to protests and making submissions to a panel that was put in place to evaluate which products should be added to the list of tax-free products, among other things. We were able to generate a strong enough movement that the tax ultimately ended up being dropped. It was a hyperlocal issue that translated into national change. And it’s not over yet. Q: You mentioned your knowledge of English helped you early on in using the Internet and organizing. How do you organize in marginalized communities in a country where so many different languages are spoken? A: Our mobile campaigns currently run in four languages. This was done deliberately to avoid creating power brokers in the communities we work in. A lot of public participation processes and information made available in South Africa are in English, which is a minority language in our country. In addition to making our platform accessible to people who speak different languages, we acknowledge that a lot of the time, people take action as a result of anger. But very often when you get angry and don’t know what to do about it, it’s easy to be overcome by a sense of helplessness. amandla.mobi is a conduit in helping people channel their anger into action by organizing together and using the power of community to make change. Q: You know, the more you talk about the techniques you use at amandla.mobi, I keep thinking it’s similar to the legacy of community organizing tradition that President Obama was trained in and inspired by. Does that seem true? A: We’re all about constantly refining how to connect the right issue, using the appropriate technology, language, communication channel and decision maker, to the right person at the right time. We call it a “crisitunity,” which is making a crisis an opportunity to galvanize people into taking action to address the problem. Q: And what is the role of the press and the media in bringing attention to these crises to people who simply aren’t paying attention? A: The media is very important in the work we do. Not only is it a way of reaching our core constituents, but is also a means we find issues we campaign on especially in rapid response campaigns. But, I have to say that the media landscape in South Africa is going through a difficult time, not unlike the United States. Apart from that, we use a lot of creativity, whether costumes or how we do our banners. The best example is around the “pink tax” petition campaign where we created a giant pad costume (laughter). We called it the “revolutionary pad.” It’s made a splash at different events and has chased public figures across the country. 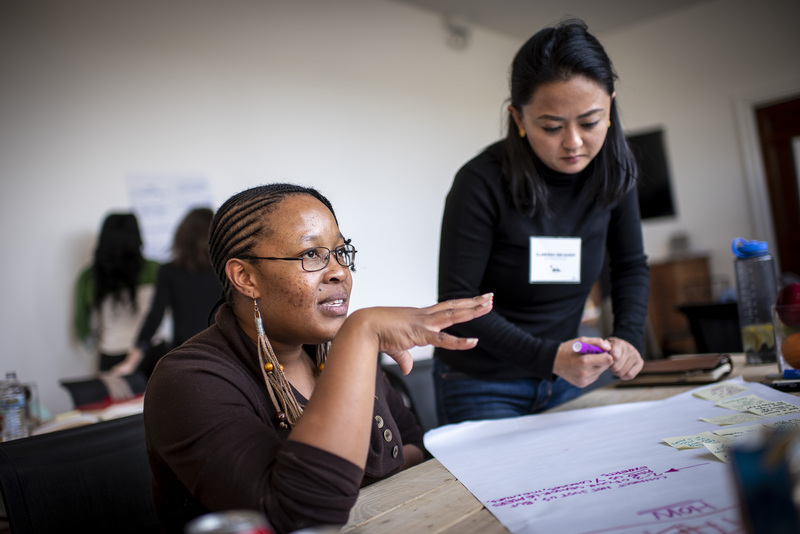 Q: To close, how do you think the Obama Foundation Fellowship has impacted your work? A: As one of two Africans in the Fellowship, to be selected for this program is a big deal. It’s given the organization much more visibility than I’d actually ever anticipated. We’ve had to set up a separate email account to be managed by our team of three since we’re receiving so much interest. Apart from the very practical ways in which my skills have been refined, it’s also been inspiring to be part of an international network of people working to change the world. Now is the best time for global solidarity, so I hope to keep expanding our international partnerships to advance our work. You can learn more about Koketso, amandla.mobi, and the rest of the Fellows here. You can join the amandla.mobi community by visitingwww.amandla.mobi or sending an SMS text to 07435 POWER.